Physicians Formula has developed for the first time the clinically-tested, cosmeceutical skin care line! The three skin care collections are aimed towards three skin concerns: Aging, Moisture Balance and Sensitivity & Redness. Each skin care collection offers solution-based regimens featuring 3 simple steps: cleanse, moisturise and treat. 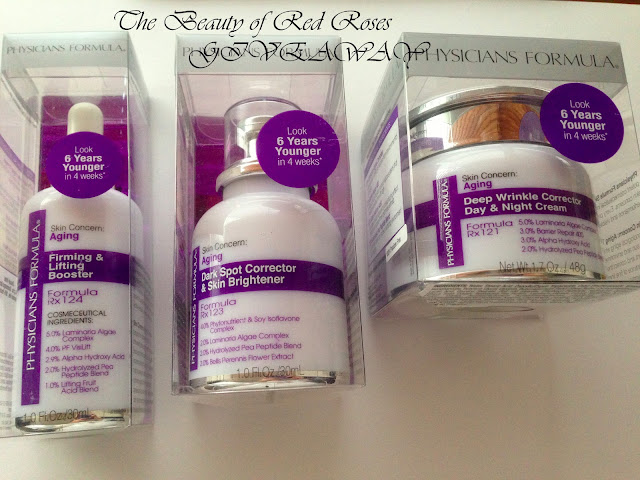 Thanks to Physicians Formula, I am giving away three products from the Physicians Formula Aging collection to one of my lucky readers! The prize includes a Dark Spot Corrector & Skin Brightener, Deep Wrinkle Corrector Day & Night Cream and Firming & Lifting Booster, valued at A$90. Wrinkle Corrector & Firming Cleanser (A$29.99): a rich cream which aims to remove both makeup and impurities while smoothing, firming and protecting skin’s moisture barrier. This cleans also aims to leave the skin clean, smooth and moisturised. Wrinkle Corrector & Firming Moisturiser SPF15 (A$29.99): The moisturiser instantly enhances skin’s firmness, hydration and also radiance. The formula also contains SPF15 to protect the skin from UVA/UVB rays while decelerating the aging process. The moisturiser is lightweight and helps to improve the appearance of fine lines and wrinkles. Deep Wrinkle Corrector Day & Night Cream (A$29.99): This day and night cream is rich in texture and works to encourage the skin’s cycle of repair and cell renewal. This cream also strengthen’s skin and protects collagen, which is the key protein which maintains firm skin. Intensive Wrinkle Corrector Eye Cream (A$29.99): This eye cream targets fine lines and wrinkles to reduce their appearance on the eye area. The cream helps to boost moisture, elasticity and firmess to improve the appearance of crow’s feet and puffiness. Dark Spot Corrector & Skin Brightener (A$29.99): This rich serum targets signs of uneven skin tone and helps to reduce the appearance of dark spots derived from sun damage, dark patches and skin stresses. The formula contains anti-oxidants to reduce the appearance of uneven skintone and pigment formation. Firming & Lifting Booster (A$29.99): This skin firming serum helps to improve medium to deep wrinkles and fine lines. The serum delivers moisture to help plump the skin and reduce the appearance of sagging skin. To enter my giveaway, just wait for the Rafflecopter widget to load and follow the prompts. Giveaway is open from 13th February 2013 until 1st March 2013 11:59PM AEST. Open to Australian residents only. Thanks so much for the generous giveaway! I would love to win to share with my sister on her birthday. She is on a hunt for a new skincare routine. I'd love to win! With 30 approaching, i'd like to turn back the clock on my skin! Starting to get a few unwanted wrinkles!! I would love to win this so that I can ACTUALLY look my age, it is unbelievable what having children can do to age our skin...help! I'm 32 and dating a 19 year old, I have to look afer my skin and keep fooling everyone that I'm a teenager too! At my age, I need as much help as possible to keep my skin from sagging south. I would love to win these goodies - I am turning 30 this year and need all the help I can get! I would definitely describe my skin as "aging" so I need all the help I can get! Thank you for the great giveaway. I have passed the 40 mark and am now seeing the first signs of aging.... and I'm not very happy about that!! These look really awesome! I'm in the market for an eye cream that reduces crepiness, in particular. I wanna win bc my derm recommended this brand to me and i have yet to try it! This looks like a wonderful remedy for my skin which is now showing the effects of my past sins! My skin is hideous and much-neglected .. it needs some serious attention! To feel pampered:)) Having flawless wonder skin is a dream, this would help make it come true. I've heard such great things about Physicians Formula, I would love an opportunity to try it! Dark Spot Corrector and Skin Brightner - just what I need. I've got my first "liver spot". I'm only 41 and I stay out of the sun! I need to use something now so that I don't look like and old lady in ten years time. This just may be the formula this 40 something wall flower needs to blossom into a thirty something BEAUTY OF RED ROSES. I'd love to win this to give to my mum for her 60th birthday. I need all the help I can get so I'm am more yummy mummy than scummy mummy! After a trying time coping with a child with a mental illness life has left me looking much older than my years, I'd love a pick-me-up for my skin.